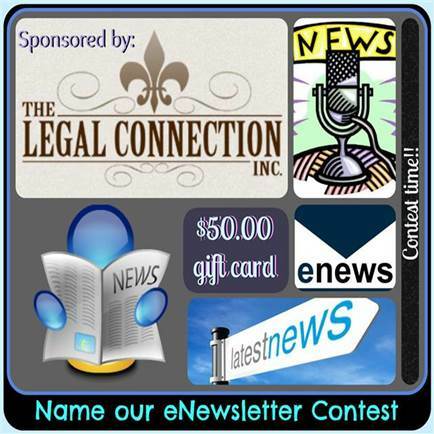 Please help us name our newsletter and you could win a $50.00 gift card. Send your name suggestions to e-newsletter@txpd.org no later than June 20, 2014. One lucky winner will be selected by the Committee and announced at the Annual Meeting. Get creative! We want a fun name that reflects the Division’s values and diversity. *The domain that originated the eNewsletter, just in case you did not receive it is: e-newsletter@pmta87.dedicated.bmsend.com (add e-newsletter@txpd.org to your email inbox and/or white list the domain from which the email originated (pmta87.dedicated.bmsend.com) on the list of acceptable sources. This entry was posted on June 1, 2014 at 4:14 pm	and is filed under Uncategorized. You can follow any responses to this entry through the RSS 2.0 feed. Both comments and pings are currently closed.